A cheat sheet containing what really works. 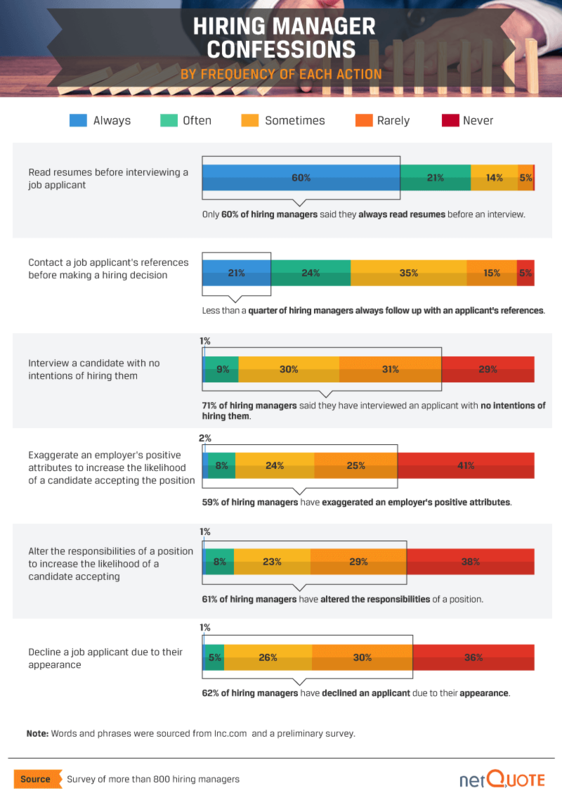 800 hiring managers reveal their preferences in a survey by NetQuote. Infographics help unearth the worst words to use in an interview, most important questions, and ideal resume length. Figuring out how to present yourself just got easier. Congratulations. You got the interview. You’ve already done better than all of the other job applicants whose piles of resumes have lead nowhere. But watch out. A hiring manager holds your future in their hands, so the interview is a do-or-die chance to get where you want to go. 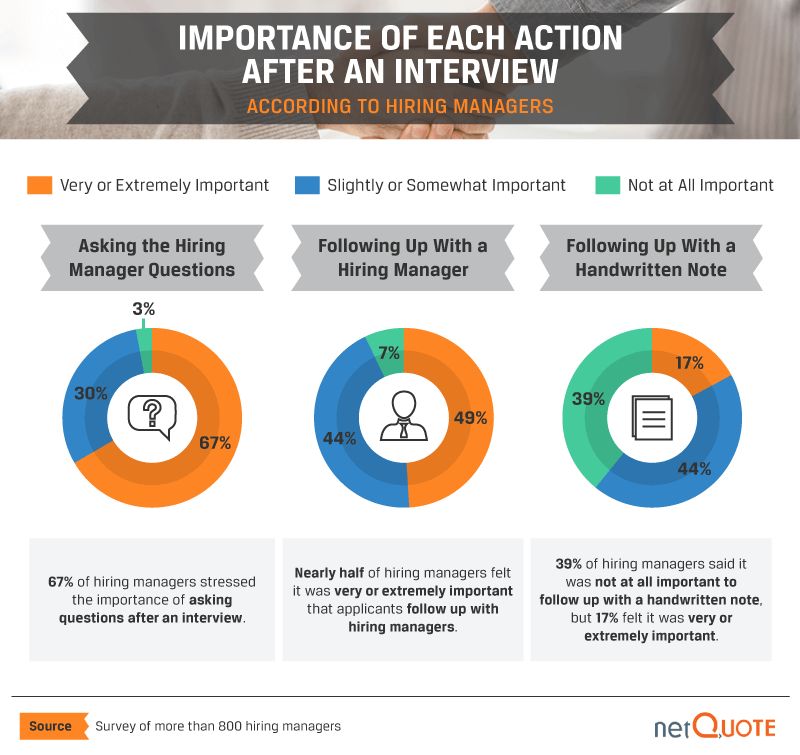 NetQuote decided to ask 800 hiring managers what, to them, makes for a successful interview. Or not. Infographics from that data have just been published as Most Important Interview Questions. All visualizations in this article are by NetQuote. According to NetQuotes’ respondents, when racing through a bunch of resumes, your story’s visual presentation can prove to be an instant turn-on, or -off. 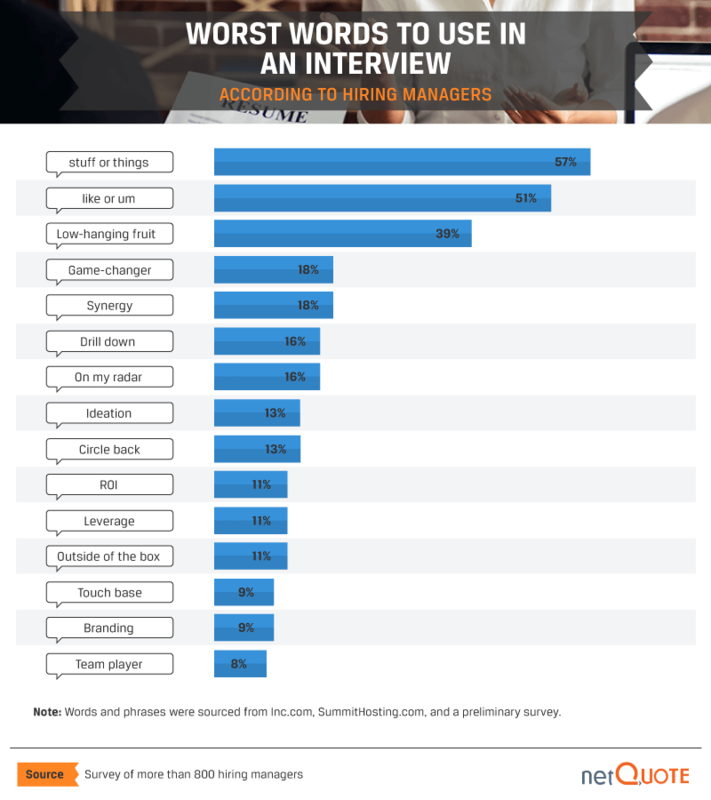 42% of hiring managers aren’t fond of headshots, for example. Ditto for unconventional, flashy resumes—they’re not necessarily a good way to stand out, at least not to the 65% of hiring managers who aren’t impressed with them. 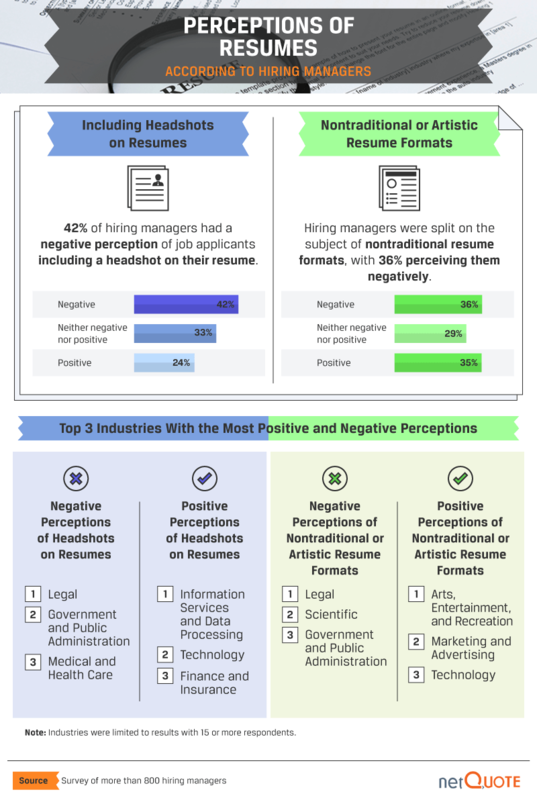 Still, the reactions vary by industry; head shots are poison for government, legal, and health care jobs, but popular when you’re after a tech-oriented position. And not shockingly, non-standard, artistic resume layouts are more likely to be appreciated in industries peopled by non-standard artistic types. Is a long resume impressive or a problem? Hiring managers are busy, and don’t really care about your life story. If a resume is even just two pages long, 23% of hirers say it’s too long. Bump that up by one more page, and it’s 51% of them bugged by your verbosity. Another thing that can be a red flag, depending on the industry, are periods not covered by a job. In IT, for example, an employment gap of 13 months or more means you’ve probably got a problem. So, you’re in the room—or on Skype or the phone. Someone once said, “I never sound as stupid as when I’m trying to sound smart,” and this is definitely an interview hazard. You may think business-speak buzzwords like “synergy,” “low-hanging fruit,” and “ideation” make you sound cool. Not so much. In an interview, yours isn’t the only performance going on, and some hiring managers are sketchy about playing their own roles. They may try to impress you by tweaking the job description or the company’s outlook. And only about 60% actually read your resume before talking—which is to say 40% know basically nothing about you as the interview starts. 29% are wasting your time anyway, since they already know they’re not hiring you. Of all the questions commonly asked, four stand out as most important. Two reflect on your character in the workplace: How you deal with conflict and how you learn from mistakes. The third inquiry reveals you as either an ambitious forward-looker or a disagreeable malcontent: Why did you leave your last job? Then there’s that moment where you’re asked to list your strengths—more about this below. Interestingly, one classic query doesn’t seem to matter much at all: What you’re into outside of work. Okay, this one’s kind of the master cheat sheet. Don’t lie in your interview, but here’s what you’re supposed to say. Are you being interviewed by a woman or man? 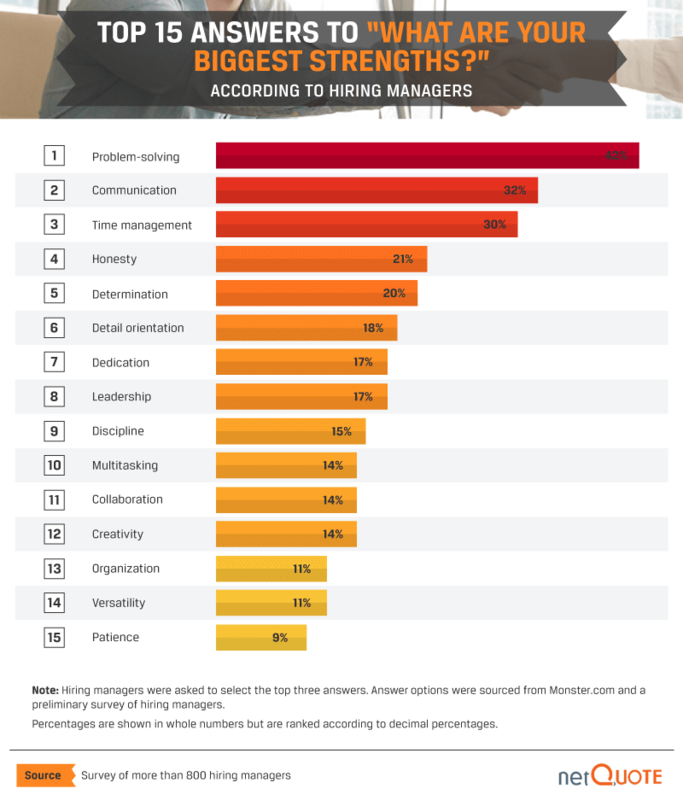 The list above notwithstanding, women and men have slightly different priorities in what qualifies as applicant’s most important personal strengths. 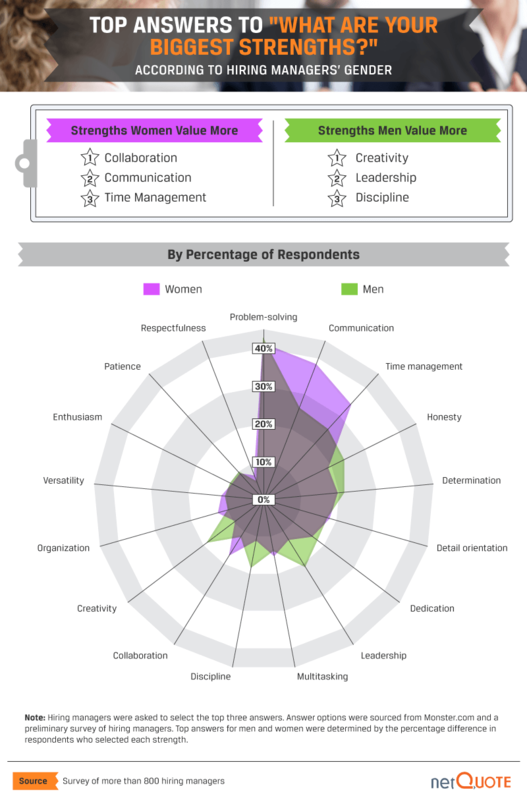 It seems close to a cliche, but female hiring managers are more concerned with quieter, inner-focused skills while males are interested in outward-going traits. Discuss. Here’s a helpful infographic. 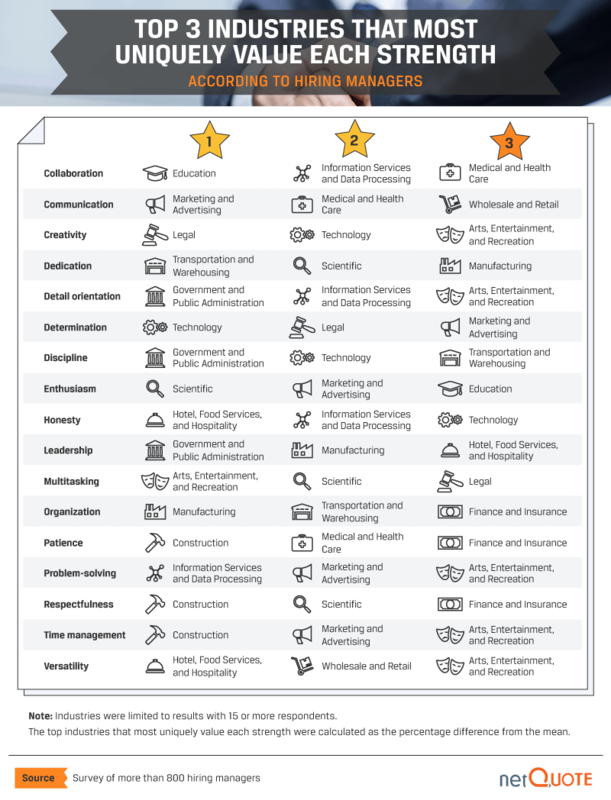 Different strengths matter to different industries, and this shows the three most important strengths in each type of operation. For government work, discipline’s hot; in construction, it’s important to manage time well and to be patient. Who’d guess that the industry that most values creativity is the legal industry? Hiring managers also have feeling about your actions after the interview. 67% expect to be asked questions, and they consider doing that to be important. Slightly less than half expect any worthwhile applicant to follow up by email or by phone. As far as handwritten followup notes go, while they’re important to 17% of hiring managers, more than double that percentage said don’t bother. Whether you’re heading into the hot seat in the near future, or just hoping to be asked to interviews, you now have some insight as to what the interview process looks like to hiring managers. Now go and get that job!